"This is an appetizer reminiscent of New York City's street vendor hot dogs. 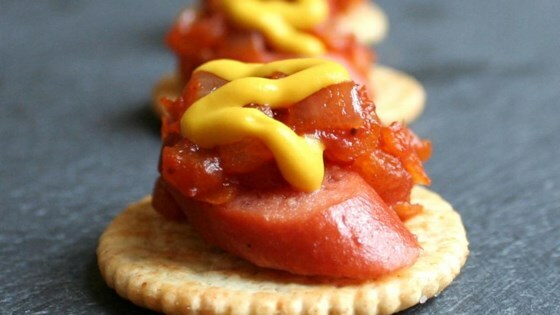 A crisp, classic RITZ Cracker with a slice of cooked hot dog topped with push-cart style hot dog onions and finished off with a drizzle of yellow mustard--a perfect one-bite snack." Heat oil in a skillet on medium-high heat. Add the diced onions; cook and stir until fluid has evaporated and onions are soft, about 8 minutes. Stir in hot pepper sauce, sugar, and chili powder. Simmer for about 2 minutes. Add tomato paste and water; stir. Simmer for another 5 minutes. Remove from heat. Arrange RITZ Crackers on a serving platter and top each cracker with a slice of cooked hot dog. Spoon a small amount of the hot dog onions on top of each. Drizzle the yellow mustard on top of the onions and serve warm. A snack-size version of the famous sandwich created by Carnegie Deli. Make ahead: Prepare onion mixture and store in an airtight container up to 24 hours ahead. Reheat in microwave before topping crackers. Great flavor! As other have mentioned the onions steal the show.